Just how far is the lone star state willing to go in order to promote their gun rights? Trigger friendly Texans are currently promoting two Texas gun bills that could change southern life. Texas State House committee advanced the campus carry and open carry bills to legislature March 17. 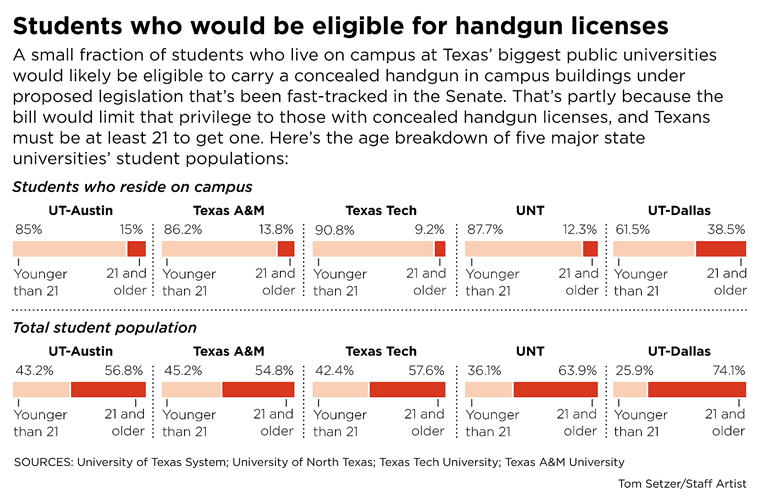 If passed the campus carry bill will permit concealed handgun license holders to bring their firearms onto any public college or university campus in Texas. While the open carry bill would permit concealed handgun license holders to openly carry holstered handguns in public places in Texas. I somewhat believe it is a good law because people can actually have protection for themselves but at the same time people will abuse the law, which could result in an increase in injuries and deaths on college campuses. Regardless of the bill being passed at Wesleyan this is still a big deal. As Texans and students we will all be affected by this one way or another. For example Wesleyan students planning to transfer to public universities could soon be faced with this issue. As well as students taking classes at both Wesleyan and other universities and colleges nearby, such as University of Texas at Arlington and Tarrant County College. The way I see it if the bill is passed it can go one of two ways. On: crime and violence increases on college campuses. Two: college campus’s become safer, which is highly unlikely. I understand the proposal affirms our constitutional rights but hello this is DANGEROUS. Students could improperly store guns or accidentally misfire. Not to mention faculty and staff are not trained on how to protect students in gunfights. And just how much is this going to cost? The Houston chronicle reported last month the implementing campus carry could cost the university of Texas system more than $39 million over six years, as stated in an article on TribTalk.com by Catherine Nance, March 16. That money needs to be spent on education not firearms. College is a place to learn and grow. Here we are supposed to find ourselves. That’s why our professors encourage different points of view and opinions. Sometimes these views and opinions clash, sparking up an educational debate amongst students. But what happens when one student gets mad and takes it too far. Boom! They pull out their gun and an educational debate ends up being a fatal tragedy. Or what happens when a student gets mad about the way a professor treated them or their grade. Will they decide to use their gun? Or what about a student getting mad at another student? Texas state statistics on stopshooting.org have reported 29 school shootings since 1992. That’s without guns being allowed. Another point I would like to make is after the learning and class room time many universities turn into a social function at the end of the day. Students go to Frat parties and hangout, often drugs and alcohol are brought into the mix. And if that wasn’t a big enough problem now were going to add fire arms into the duo. Lastly I would like to discuss the relevancy of the campus personal protection act. In order to qualify for a concealed handgun license in Texas one must be 21 years of age, pass a rigorous criminal background check, and complete class room time, according to txdps.state.tx.us. Only a small portion of students would actually qualify. Here’s a visual made by Tom Setzer, staff artist for the Dallas morning news from an opinion article by Todd Roberson, editorial writer for the Dallas morning news. Only upper classmen will benefit. And what happens when younger students get a hold of older student’s guns? Like an 18-year-old freshmen his first semester. Some freshmen are naïve irresponsible and irrational at times. It’s their first time away from home. There not going to know how to react. Even though Texas is known for cowboys, livestock, and firearms. Surprisingly Texas is one of 20 states that ban guns on campus at the moment. 23 allow the schools to choose and 7 allow guns on campus. People for the bill argue that it is our American right to bear arms. While others say this bill opens the doors to evil. “Every citizen shall have the right to keep and bear arms in the defense of himself or the State; but the legislature shall have power, by law, to regulate the wearing of arms, with a view to prevent crime,” according to the Texas Constitution Article I, Section 23. As of now, people that poses a concealed handgun license can store their fire power in their vehicles and place of residence. But if these bills pass, there will be less guns left behind. We could see guns in the community and in public classrooms as early as August 2015. As the bill gets closer to being passed, lobbyists get riled up voicing their standpoint on the issue. Kory Watkins, Leader of open carry Tarrant County, strongly states his desire for the bill in an online article by MSNBC. While Dan Gross president of the Brady Campaign to prevent gun violence called the bill evil and dangerous in the same online article by MSNBC. “It is basically a proposal promoted by the gun lobby and its lap dog politicians,” Gross said. What is your stance on the issue? Are college campus’s really that dangerous? My answer is No. We need to leave the guns at home and focus on learning and fighting with our brains.